There's still more to do, but with the weather having turned cold and wet and windy, I'm calling the seemingly never-ending deck refinishing project "done" for now. 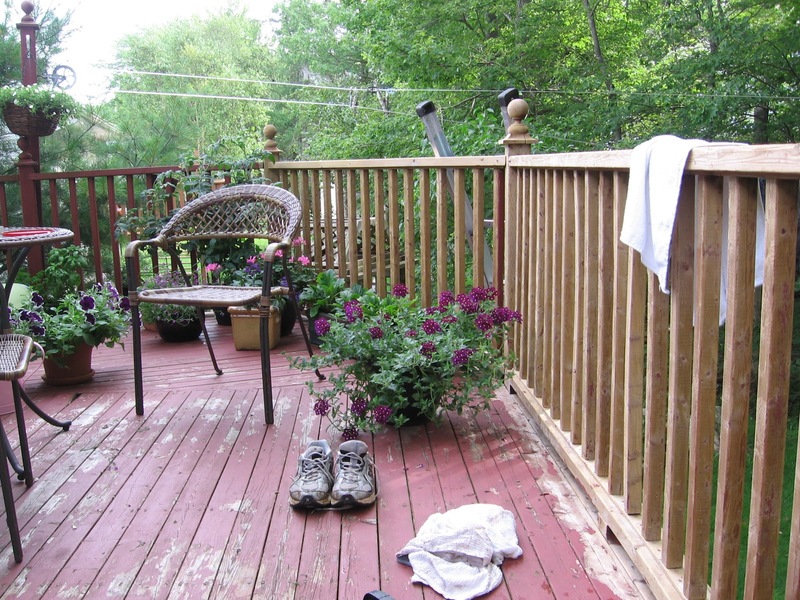 We started in July 2011 -- last year -- thinking it would only take a couple of weeks to take the old solid deck stain off, clean, and put a new coat on. Here's what we were facing. Some areas were flaking badly. Others had a green film. We bought jugs of high-powered and expensive Behr deck stripper. It's caustic stuff and we have the scars to prove it! We had mixed results. Some patches of paint would come off cleanly by following the directions: Apply the stripper, let it sit for about 20 minutes while misting it to keep it wet, then wipe or hose it off. Other areas needed some heavy scrubbing or pressure-washing to get the paint off. 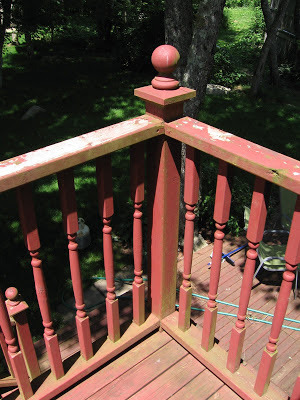 And we were stumped by areas in which the paint -- no, it's really solid deck stain, but it might as well have been paint -- would not come off at all. Multiple treatments with stripper, scrubbing, pressure washing and rinsing were still not working. So, we tried a quarter-sheet orbital sander. Nope. We bought a belt sander. Better, but still not great because of nails and uneven wood surface. What was supposed to take a week or two was stretching into a year. 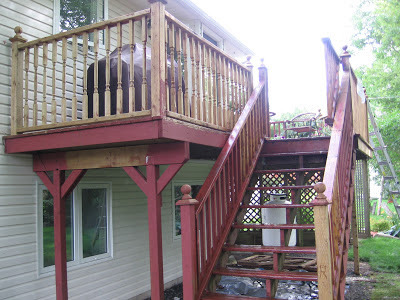 We considered burning down the deck but could not imagine a way to do so without a) damaging the siding and b) attracting unwanted attention from insurance adjusters. Eventually, at some point in the summer of 2012, we gave up. 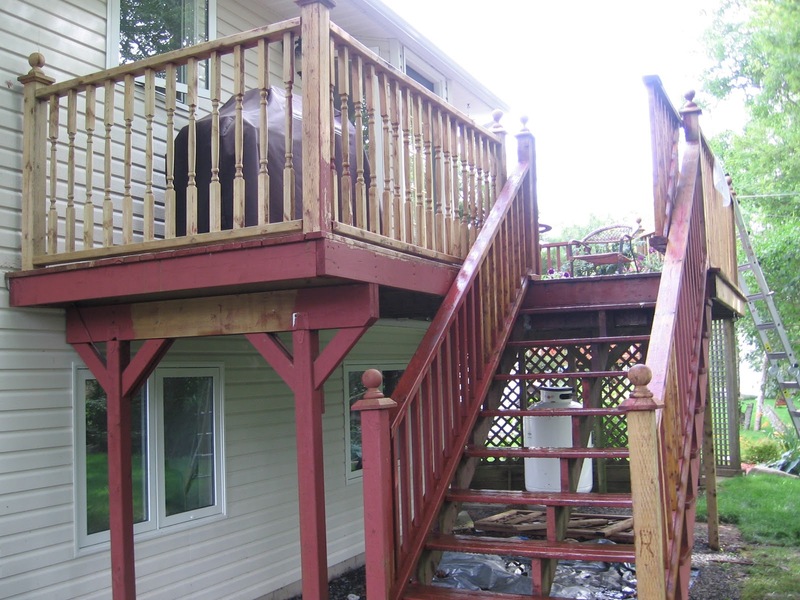 There was no way we were going to be able to get the wood to a condition in which a semi-transparent stain would work. It was impossible. We decided to give the deck one more pass with the belt sander, then the cleaner, and then a solid stain. Short of building a new deck, this seemed like the best idea. Stain it with solid and save up for a new deck. Even that took a lot of work, but I made a lot of progress in a few marathon sessions. It's not perfect, but it is very, very nice. Amanda picked the colour. It still needs a thorough once-over for those "oops, missed a spot" reapplications, and apparently I need to finish some areas which can't be seen, but still need to be done. But for now, I'm calling it finished. DONE. It looks great, for all your hard work.